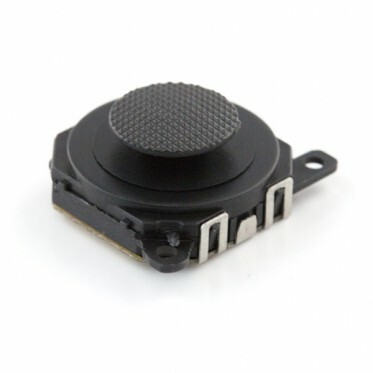 This is a resistive analog joystick, very similar to those found on the PSP1000. These compact joysticks are different in that they have a very interesting 'slide' feeling. Just to make sure I'm clear, my pin 4 is the one closest to the two screw/mounting holes. When connected to an Arduino, I get a range of about 128 to 775 on each axis, with enough consistency to check if it's at -x, center-x, +x, and -y, center-y, and +y. The cap is removable, and is covered with a 'sticky' material so your thumb won't slide off. The pads are spaced by 2mm, but it is possible to get our 2.54mm headers connected with a bit of bending. We're trying to get a breakout board put together. Should be available soon!